This class 3 vertex patient has medium caliber, dark brown hair with well above average donor density. 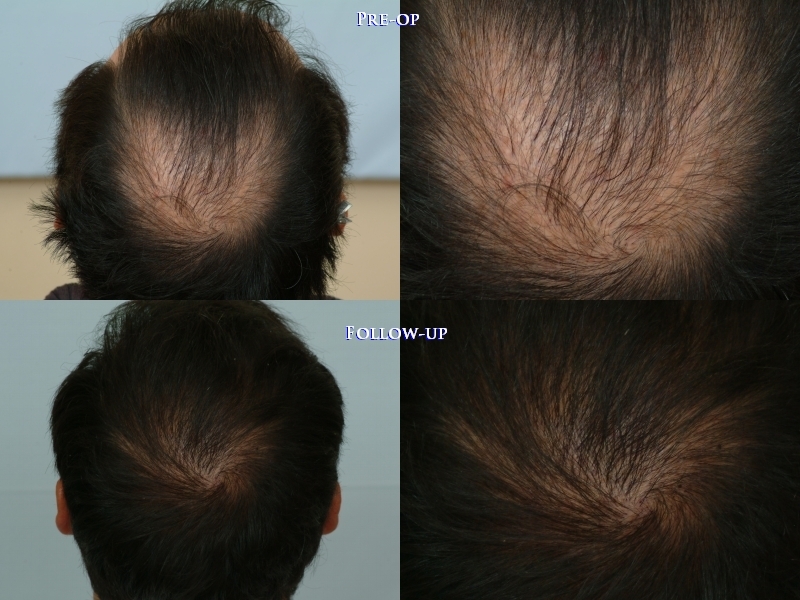 Dr. Cole’s treatment plan for this patient was to transfer 740 CIT/C2G grafts into the vertex. C2G is a CIT (non-strip) preparation method where advanced technology allows our surgical team to harvest over 1500 grafts in an 8-hour day, without exposing any scalp. This method gives our patients the option to leave our clinic without any trace of extraction/harvesting in the donor area. The goal of this patient was to improve the overall appearance and density in the vertex that once existed. Subsequent to the CIT procedure, the patient received a small session of micro/mini grafts. The pre-existing mini grafts may require redistribution to eliminate the grafted appearance. Transplanting too high of a density into a recipient area that is already relatively dense can cause fatal trauma to the pre-existing (native) follicles. High densities placed into an already progressively thinning crown can create a bigger problem than most patients seem to know prior to the procedure. 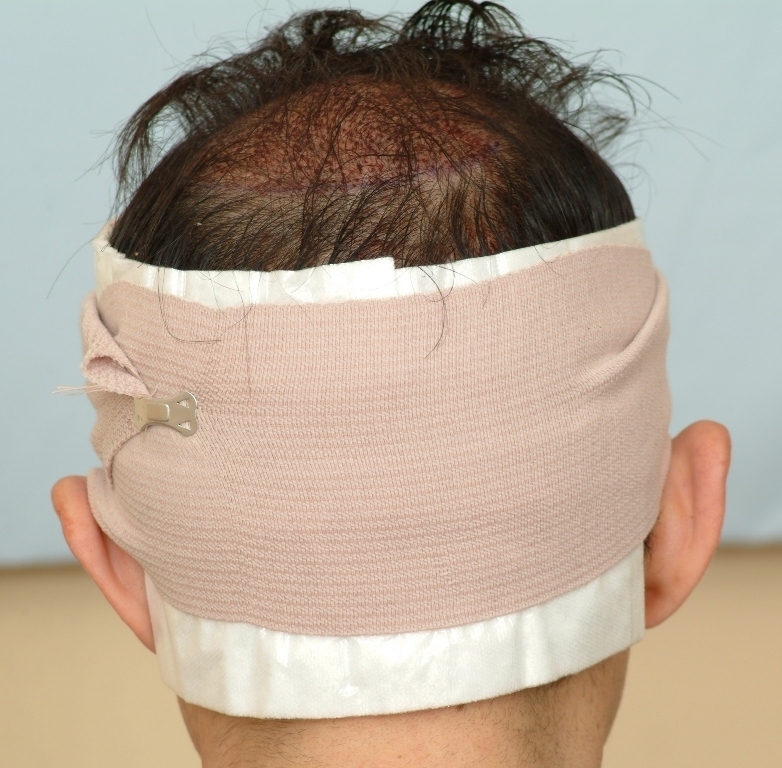 For example, a surgeon transplants 200 multi-hair grafts on a patient who only has a 50 sq. cm. size area of recession, the patient will have a great risk of having an unnatural appearance. In the future, after hair loss has occurred, the density that was once considered to be the corrective treatment can be problematic, especially for those patients who 1. Don’t have an adequate supply of scalp donor resource. 2. Experience poor growth from aggressive procedures. 3. Cannot financially manage restoring their hair loss. Chasing hair loss can be made easier by having a less aggressive approach, thus a procedure that formulates an exit plan. Clinics should have patients’ best interests at heart, improving their quality of life in the long-term. We prefer to put all patients on treatment plans for the long-term, rather than just treating them for present time. Hair loss in a typical thinning crown (vertex), normally, gradually, recedes outwards in all directions until the entire crown becomes bald. The most difficult aspect of restoring density in the vertex is replicating the natural hair growth angles, as well as recreating the natural whorl. The crown/vertex naturally patterns itself in 360 degrees. This region of the scalp usually requires more transplanted follicles than any other area, due to the fact, that it has no consistent grain. Grafting a crown is a delicate process that requires skill and artistry. Follicular units found in the crown can naturally be single-hair follicular units or multi-hair follicular units. Patients seeking hair transplant surgery to restore the crown should understand that hair loss will continue to some degree, and that no hair transplant procedure can increase the overall volume of hair on their scalp. Medical therapy can be advantageous for patients once they have researched the pros, cons, and possible side-effects associated with those medicines. Those who suffer from advanced hair loss, commonly use medical therapy because, their hair loss in the crown/vertex can expand to a degree that cannot be fully restored. Those patients must use other methods (body hair) to increase density in the area. This patient declined the use of any medication. In 14 months post-op, the growth is ideal without this patient ever having to expose any scalp in the donor area or recipient area. We are excited for this patient and another successfully treated case. This is very encouraging, good coverage with only 741 grafts, it shows that as long as we are not greedy for a thick hairline, there is hope even for norwood 5 or 6. » norwood 5 or 6. Yes. A great result in the crown is quite significant, considering the physical features of a whorl. The medium skin tone and dark hair compliments this patient’s crown well. After grafting the crown, patients should expect some additional loss in the future. When that time comes, informed patients who have well-maintained donor area resources should have some remaining donor supply. The stressor of having additional loss can easily compound the problem if a patient has no scalp donor resources available. 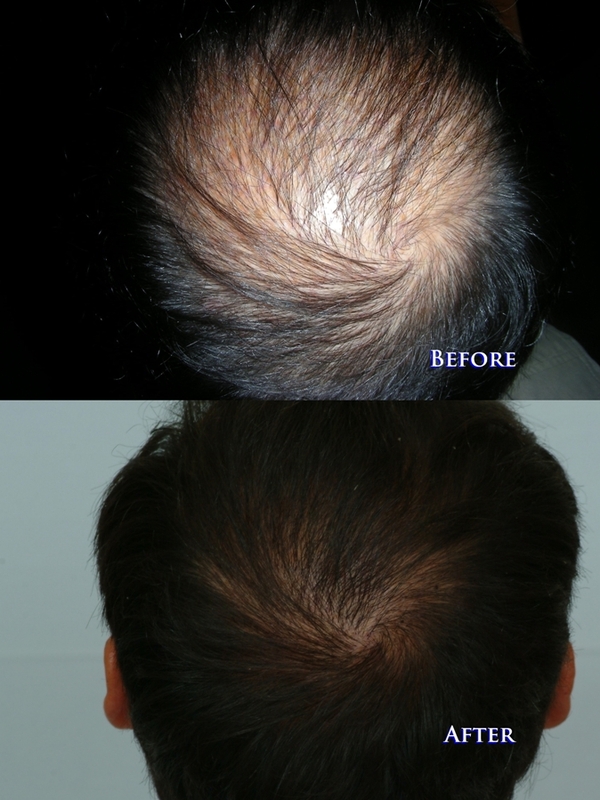 We always prefer to give patients the option to look natural even after future hair loss occurs. When patients are older, we can usually be more aggressive than if they were younger with a family history of hair loss. We warn younger individuals to first maximize medical therapy then conservatively restore density in the crown area as needed. » improve the overall appearance and density in the vertex that once existed. » to eliminate the grafted appearance. » will have a great risk of having an unnatural appearance. » treating them for present time. » the pros, cons, and possible side-effects associated with those medicines. » this patient and another successfully treated case. That’s all… I agree, 740 grafts went a long way in this case. Typically, we can put anywhere from 600 to 1500 grafts in the crown, but our objective is achieve the greatest effect with fewer grafts. This not only saves the patient financially, but it also allows the patient to save donor resources for the future. Hair loss in this area of the scalp tends to expand along the entire perimeter of the crown. » » harvest over 1500 grafts in an 8-hour day, without exposing any scalp. » » to eliminate the grafted appearance. » » will have a great risk of having an unnatural appearance. » » resource. 2. Experience poor growth from aggressive procedures. 3. » » treating them for present time. » » recedes outwards in all directions until the entire crown becomes bald. » » natural hair growth angles, as well as recreating the natural whorl. » » on their scalp. » » this patient and another successfully treated case.